In the depths of winter, indoor-blooming amaryllis (Hippeastrum x hybridum) lift snow-chilled spirits with enormous, long-lasting red, white or pink blooms. The flowers rise from large, easy-care bulbs suitable for outdoor planting in U.S. Department of Agriculture plant hardiness zones 9 through 11. With protective mulch, they may be hardy USDA zone 8. Wherever you grow them, keep your dogs and cats away. Eating any part of an amaryllis in large amounts may make them sick. 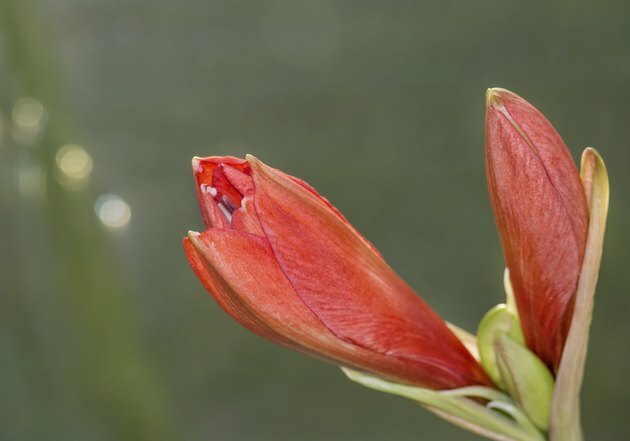 Amaryllis flowers turn heads even before they bloom. Plant outdoor amaryllis in late September or early October. Give them organically rich, well-draining soil, six of more hours of daily sun and afternoon shade. In a frost-free climate, plant the bulbs with one-half of their necks above the soil line. Elsewhere, plant them 6 inches deep and cover them with a 6-inch layer of organic mulch. Water them thoroughly and keep the soil moist until new growth sprouts. Water actively growing outdoor amaryllis only when the upper 2 inches of soil are dry, and stop during the bulbs' dormancy from June to September. When they begin growing, fertilize them with granular 5-10-10 fertilizer. Scatter 3 1/2 to 5 tablespoons -- or the label's specified amount -- evenly over each 10 square feet of soil, work them lightly and water well. Repeat when the stems are 6 inches tall and once more after you've removed the spent flowers and stems, but while the foliage is still green. When the foliage withers, cut it off at the base. Indoor amaryllis plants need sterile, well-draining potting medium. A homemade mix of equal parts peat moss and perlite works well. Water the bulbs well after potting and then hold off until they sprout. After that, keep the soil moist, not wet. To speed their growth, set the plants in a south-, west- or east-facing window with four or more hours of daily sun. Maintain them at 70 to 80 degrees Fahrenheit until they flower and then reduce the temperature to 65 to 70 F to extend their display. Rotate the pots regularly so the stems don't lean toward the light. Fertilize every two or three weeks with balanced liquid fertilizer. Mix 14 drops, or the manufacturer's recommended amount, of it per 1 quart of water. To avoid saturating the medium, fertilize when the soil feels slightly dry, in place of a regular watering. Otherwise, the bulbs may rot. Return the plants to their window after they flower. Cut the stems to soil level, but let the foliage feed the bulbs until it withers. After cutting it back, store the pots in a dark, cool dry area with no water or fertilizer. After eight to 10 weeks, put them back in their sunny spot and resume regular care. Diseases and pests rarely bother amaryllis. Mealybugs may infest them, and snails sometimes feed on outdoor plants. Look for flat, waxy-white mealybugs on the undersides of the leaves and beneath dried growth on the necks of the bulbs and dab them off with cotton swabs dipped in rubbing alcohol. Handpick snails by flashlight at night, and drop them in soapy water to drown them.